What is Purely Fancy Feast? Purely Fancy Feast entrees are a delicious way to whet your cat's appetite and can be served as a flavorful complement to your cat's regular meals. Purely Fancy Feast is unlike many other cat foods because every entree is prepared without byproducts or fillers. Each meal is made with real meat (chicken, beef, or fish) and a delectable broth cats love. Buy Purely Fancy Feast entrees with confidence with our 100% satisfaction guarantee. 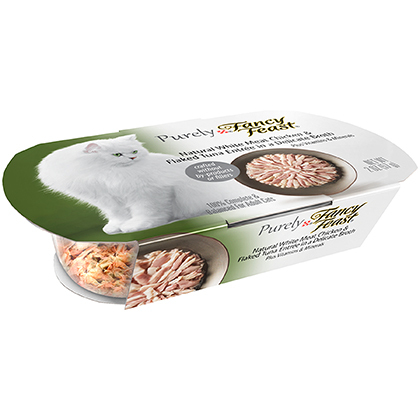 Purely Fancy Feast entrees are delicious gourmet meals you can give your cat any time. Each Purely Fancy Feast entree is made with real meat, making it a great complement to your cat's regular food or as a stand-alone meal. Purely Fancy Feast entrees are a delicious addition to your cat's diet, since each Purely Fancy Feast is made with real meat. If you choose to feed your cat only a portion of the food, you can refrigerate the rest until the next feeding time. Ingredients: Chicken, chicken broth, beef, sunflower seed oil, tricalcium phosphate, guar gum, calcium lactate, xanthan gum, choline chloride, salt, potassium chloride, taurine, zinc sulfate, magnesium sulfate, ferrous sulfate, thiamine mononitrate, niacin, Vitamin E supplement, calcium pantothenate, Vitamin A supplement, manganese sulfate, copper sulfate, riboflavin supplement, pyridoxine hydrochloride, potassium iodide, folic acid, menadione sodium bisulfite complex (source of Vitamin K activity), biotin, Vitamin B-12. Ingredients: Chicken broth, chicken, skipjack tuna, sunflower seed oil, calcium lactate, tricalcium phosphate, xanthan gum, guar gum, choline chloride, taurine, zinc sulfate, ferrous sulfate, thiamine mononitrate, magnesium sulfate, niacin, vitamin E supplement, calcium pantothenate, vitamin A supplement, manganese sulfate, copper sulfate, riboflavin supplement, pyridoxine hydrochloride, potassium iodide, folic acid, menadione sodium bisulfite complex (source of vitamin K activity), biotin, vitamin B-12 supplement. Ingredients: Chicken, chicken broth, sunflower seed oil, calcium lactate, tricalcium phosphate, guar gum, xanthan gum, choline chloride, salt, potassium chloride, zinc sulfate, taurine, magnesium sulfate, ferrous sulfate, thiamine mononitrate, niacin, vitamin E supplement, calcium pantothenate, vitamin A supplement, manganese sulfate, copper sulfate, riboflavin supplement, pyridoxine hydrochloride, potassium iodide, folic acid, menadione sodium bisulfite complex (source of vitamin K activity), biotin, vitamin B-12 supplement. Ingredients: Skipjack tuna, fish broth, sunflower seed oil, calcium lactate, tricalcium phosphate, guar gum, xanthan gum, choline chloride, taurine, zinc sulfate, ferrous sulfate, thiamine mononitrate, magnesium sulfate, niacin, vitamin E supplement, calcium pantothenate, vitamin A supplement, manganese sulfate, copper sulfate, riboflavin supplement, pyridoxine hydrochloride, potassium iodide, folic acid, menadione sodium bisulfite complex (source of vitamin K activity), biotin, vitamin B-12 supplement. Ingredients: Tongol tuna, fish broth, skipjack tuna, sunflower seed oil, calcium lactate, tricalcium phosphate, guar gum, xanthan gum, choline chloride, taurine, zinc sulfate, ferrous sulfate, thiamine mononitrate, magnesium sulfate, niacin, vitamin E supplement, calcium pantothenate, vitamin A supplement, manganese sulfate, copper sulfate, riboflavin supplement, pyridoxine hydrochloride, potassium iodide, folic acid, menadione sodium bisulfite complex (source of vitamin K activity), biotin, vitamin B-12 supplement.